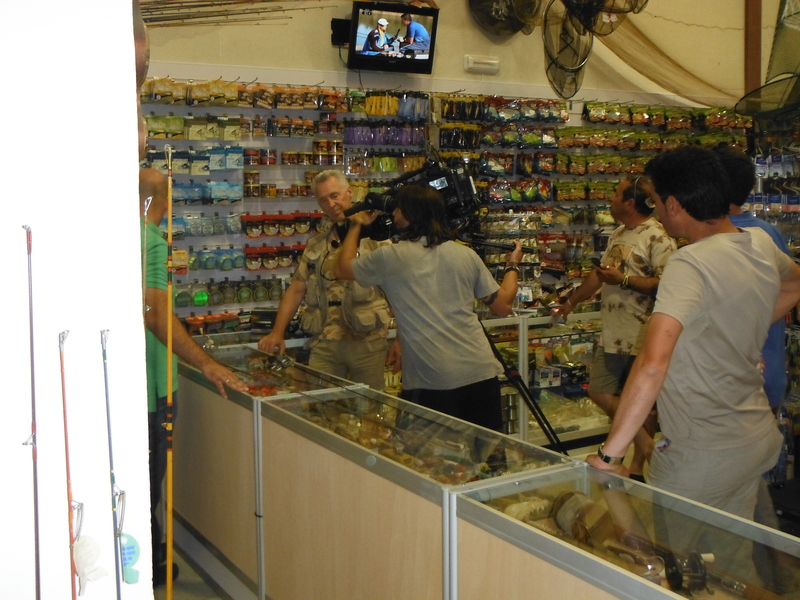 The second day of filming began in a very civilised way with a pitufo mixto and a café con leche in Éstacion de Cártama. The film crew were looking a bit weary, no doubt after a late night (it was feria time in Cártama). Guillermo, one of the producers, looked decidedly bleary-eyed through the fog of his cigarette smoke as he tried to kick start his day with a strong coffee. When he finally got to talking it was simply to express the view that it might have been good to have had one less beer the previous night and maybe one more hour of sleep. I guess many of us know how that feels. We hit the river at 8.00 am and hoped the give the film guys the chance to film some big barbel swimming around. I had been hoping the Guadalhorce might be clearing but it was, if anything, even dirtier than the previous day and so, again, we switched our attention to the Río Grande. There are some beautiful fish here and they are easy to observe in one particular hole but almost impossible to tempt with a fly although trying to do so is as good a way to spend time as any other I can think of. In the end the producer suggested that they just film us fishing and leave the filming of those big fish for another time. Thankfully, we managed to get a nice fish almost straight away and another a little later in the morning. The previous evening John and I had visited Norman Smith and his wife Maureen who live close to the base where John and the film crew were staying. They are terrific company and veteran fishermen. You should see their finca – the walls are covered with photos of carp and barbel and various tropical saltwater fish. There are some real whoppers too. Anyway, we suggested that Norman visit us on the river and he duly arrived on the riverbank the next day and was rapidly conscripted into the unfolding drama. The producer, Raul, asked him to strike up a conversation with John. I found all of this pretty hilarious really. These guys have known each other for years and even featured along with Maureen in a film about fishing for giant catfish on the Ebro but for this sequence they were instructed to be strangers. So Norman wanders along the river bank and greets John who is busy fishing and the two boys start shooting the breeze. They are both Englishmen long resident in Spain but for the benefit of the viewers they are rattling away in Spanish. Norman tells John about an interesting museum of fishing which we were to visit later and then the guys part company again. This short sequence of film and others like it create a kind of “filler” which connect different parts of the programme. It was a part of the filming process I had not really considered before. John and I were frequently asked to “act” out scenes where we simply approach a stretch of river or wade across it. These sequences can then be used to facilitate a smooth transition between a part of the programme filmed in one place and a part filmed in another. I guess it all makes sense. John and I were similarly filmed entering the museum and chatting with the owner on the pretext of needing to purchase some leader material for our fishing. 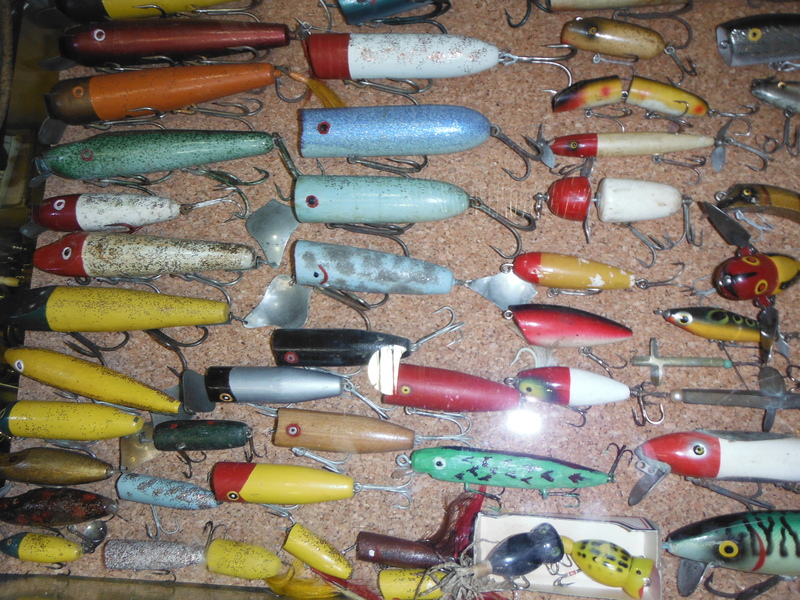 Then the owner begins to describe one or two items from his extraordinary collection of vintage fishing gear. I have to say that this museum and fishing tackle supplier really is a hell of a place and well worth a visit if you happen to find yourself in this neck of the woods and I hope to write a short piece in a future post to describe it. You should see the collection of fishing stuff at the museum. 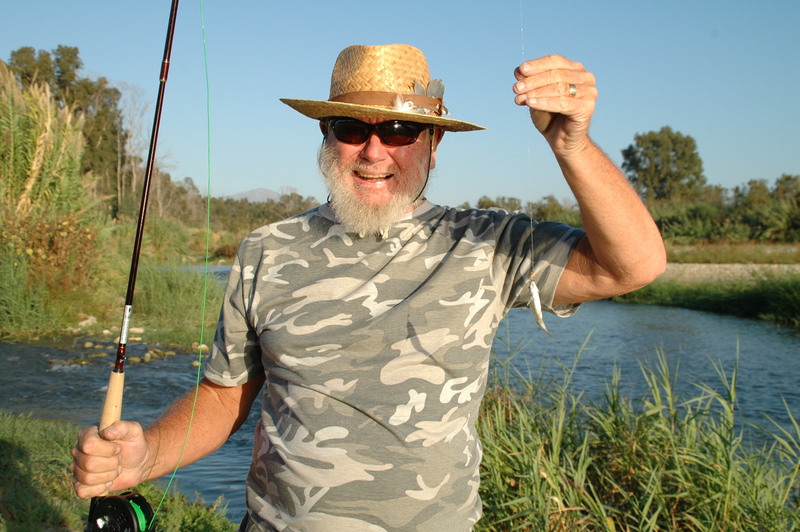 Norman´s first fly-caught fish. Things can only get better! Seriously looks like it was an interesting project and good fun. Have seen and enjoyed quite a few of their previous productions as they are often packaged free with some of the monthly fishing mags. Hope it doesn’t bring too many anglers to your river …that would be a shame.